Helen Van Wyk has encouraged artists all over the world to get painting and to "give it another try". 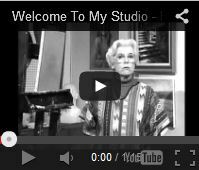 Distilling fifty years of painting experience in the Welcome to My Studio series, Helen shows you in this DVD through a complete demonstrations, how to paint the color white and how useful is it. Covering color mixing and offering guidance about light and shade, this strangely interesting subject holds quite a few surprises as Helen paints a still life. The final lesson in this video covers snow, in particular its color, as Helen paints a winter scene of an old red barn. Helen attributes her own success to a thorough understanding of painting principles, plus "discipline, dedication and practice." While the last three can only be found in oneself, her principles are preserved in these videos. You will find yourself watching them over and over again.